Monday night Presidential debate saw Hillary Clinton and Donald Trump go into a war of words over jobs, eradicating terrorism and ending racism in a bitter television debate. The showdown at Hofstra University saw Hillary begin with an attack on Trump for his blatant disregard for women, calling him a racist and a sexist. 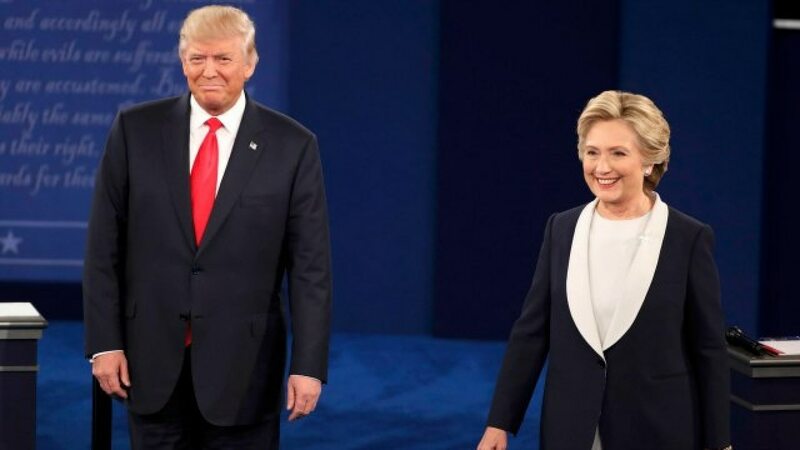 In the first swing of the debate after the accusations by Hillary, Trump was thrown into the defence corner over his temperament, defiance to release his taxes and his ill remarks about people of colour and women. As millions of viewers watched on, the two rivals engaged in cross-talks in the fiery debate that started about racial healing in America. Here are the Highlights from the debate. Holt asked Trump why he brought about the ‘deceitful claim’ that Obama was born abroad – one he claimed to have settled in 2012 but which he continued to dismiss publicly until weeks ago and why he suddenly changed his mind. Giving one of the most unconnected answers of the night, Trump linked it to Clinton alleging that she somewhat began the birther conspiracy – a claim that Americans deem false. When he was done, Clinton pounced. ‘Just listen to what you heard,’ Clinton said. He has really started his political activity based on this racist lie that our first black president was not an American citizen. There was absolutely no evidence for it. But he persisted,’ Clinton continued. Clinton also attacked Trump over a federal racial discrimination charge levelled against his father’s real estate company in the 1970s. ‘He has a long record of engaging in a racist behaviour,’ Clinton declared. ‘I never said that,’ Trump interrupted. ‘Who has said women don’t deserve equal pay unless they do as good a job as men?’ Clinton added. ‘I didn’t say that,’ he objected again. ‘And one of the worst things he said was about a woman in a beauty contest,’ Clinton lectured. ‘He loves beauty contests, supporting them and hanging around them. And he called this woman Miss Piggy, then he called her Miss Housekeeping because she was a Latina. ‘Oh really?’ Trump asked after cutting into the claim to ask Clinton where she had heard the stories about the Venezuelan-born Machado, who was crowned Miss Universe in 1996 when Trump was the owner of the pageant. Trump battled back, stating that Clinton’s tough critiques of Obama during their bitter 2008 primary battle. Clinton received a backlash from Trump for using a lot of rhetorics in campaign ads. ‘Hillary is hitting me with tremendous commercials,’ he complained, insisting that he wasn’t about to use a pointed insult he had brought to the debate. ‘You want to know the truth? I was going to say something extremely rough to Hillary, to her family, and I said to myself, “I can’t do it. I just can’t do it”, Trump claimed. ‘It’s hundreds of millions of ads,’ Trump said, ‘and the only gratifying thing is I saw the polls come in today, and with all of that money, over $200 million is spent, and I’m either winning or tied. And I’ve spent practically nothing’. After the statement, Trump’s supporters were heard applauding him. Clinton fought back with this response and got her supporters clapping and nodding in admiration. ‘As soon as he travels to 112 countries and negotiates a peace deal, a ceasefire, a release of dissidents, an opening of new opportunities in nations around the world, or even spends 11 hours testifying in front of a congressional committee, he can talk to me about stamina,’ she declared. ‘I have the feeling that by the end of the evening I’m going to be blamed for everything that’s ever happened,’ an exasperated Clinton interjected after getting repeatedly hit by Trump on taxes and trade. ‘Why not?’ Trump answered in just one of his unsolicited witty remarks. Trump slammed Clinton’s claim that Russian state actors hacked into the Democratic National Committee, alleging that anyone could have done that. ‘Maybe it was. It could be Russia,’ Trump added as he reminds viewers of the big hack that disclosed a Democratic Party plan to make Clinton a presidential nominee. ‘It could also be China,’ he added. In Response, Clinton said Trump praised and encouraged Russian president Vladimir Putin to hack Americans. This is in connection to Trump’s response after the embarrassing hack made news suggesting that Russia should also show the world Clinton’s emails from her time as secretary of state – 33,000 of which she later deleted. ‘We should be better than anybody else, and perhaps we’re not,’ Trump said of American cyber capabilities. Clinton said Trump’s attitude to nuclear weapons is too casual. ‘His cavalier attitude about nuclear weapons is so deeply troubling,’ said Clinton. ‘A man who can be provoked by a tweet should not have their finger anywhere near the nuclear codes,’ she said. ‘That one’s getting a little bit old,’ Trump grumbled. ‘It’s a good one,’ Clinton retorted. Clinton alleged that she calls Donald Trump’s economic policy ‘Trump up, trickle down’ economics, making reference to the loan he got from his father. “There is something he is hiding,” she added. Trump further said Clinton was going to endorse one of the largest tax increases in history. He also blasted Clinton for supporting a Pacific trade deal, which she once called the ‘gold standard’ but ultimately opposed. ‘Well, Donald I know you live in your own reality,’ Clinton shot back. ‘When it was negotiated, which I was not responsible for …’ said Clinton, talking about the deal by President Obama. ‘So is it President Obama’s fault?’ Trump asked. Clinton told a little history of Trump little beginning, saying he started the business with $14 million he borrowed from his father but said business strategies don’t always work in politics. She added that Trump’s tax policies are in favour of his business and will make him grow even more empires. ‘In fact, it would be the most extreme version … I call it Trumped-up trickle-down,’ Clinton jabbed. Trump shot back, saying that all American businesses will be relieved of tax. ‘Under my plan, I’ll be reducing taxes tremendously … for companies – small and big businesses,’ he said. Trump seemed unsure what to call Clinton at first. Earlier Trump didn’t know the name to call Clinton but minutes later decided to call her by her name. – Clinton Hillary’ for not doing any of these things she promising now after age-long experience in government. ‘I have thought about this quite a bit,’ Clinton insisted. ‘Yeah, for 30 years!’ Trump blasted. ‘You haven’t done it,’ he said later. Trump said Clinton’s policies will let America’s jobs go to Mexico and China. ‘You are going to drive business out… You are going to regulate these businesses out of existence,’ he said. ‘But you have no plan,’ Trump said during their clash over jobs and trade. ‘Oh I do,’ shot back Clinton. ‘I have written a book about it. You can pick it up tomorrow at a bookstore or an airport near you,’ she told her opponent. ‘You are going to drive business out. Your regulations are a disaster,’ he interjected. ‘You have regulations on top of regulations and new companies cannot form, he said. Clinton mentioned her own father several times during the debate – and tried to get Trump’s goal by going after his business record, which he holds out as his top qualification for office. He brought up his multiple bankruptcies and mentioned specific contractors who she said got stiffed by Trump. Clinton even brought an architect who had designed one of Trump’s golf courses. ‘It’s a beautiful facility. It immediately was put to use and you wouldn’t pay what the man needed to be paid,’ Clinton said. ‘Maybe he didn’t do a good job because I was unsatisfied with his work,’ countered Trump. Clinton then shed light on her family background, when her late dad used to hang drapery. ‘I am certainly relieved that my late father never did business with you,’ she told the billionaire. ‘Look it’s all words, it’s all sound bites. I built an unbelievable company,’ he said. On occasion, four times we used certain laws that are there,’ Trump said of bankruptcy filings. ‘First of all, they did get paid a lot,’ he said of his contractors. ‘I take advantage of the laws of the nation because I’m running a company,’ he explained. Finally, Holt wrapped up the 90-minute contest of words by asking the two rivals if they will accept the result of the campaign and they both gave their honest answers; yes. Even though Trump once alleged that the system is corrupt and rigged which led to many speculating that election result may be contested. ‘I support our democracy. Sometimes you win, sometimes you lose but I certainly will support the outcome of this election,’ Clinton responded. Trump, in response first reference his ‘Make America Great again’ slogan twice before saying ‘If she wins, I will absolutely support her”. Clinton looked sound during the debate and didn’t show any signs of physical ailment only two weeks after collapsing at a 9/11 memorial service. Trump, though, had the sniffles – and people in the auditorium could hear it. ‘Do you feel good tonight? Well, I sure do,’ she said. Bill Clinton and New York governor, Andrew Cuomo, a liberal Democrat accompanied her onto the stage and with Andrew saying she ‘won hands down’. Clinton sang ‘Aint No Mountain High Enough’ briefly and said: ‘Well, it was an amazing experience. And I am so happy we had this opportunity for the first presidential debate right here in New York at Hofstra University. Bill Clinton, standing stage right with Cuomo, flashed a thumbs up to the crowd. The couple were then driven back to their Chappaqua home. She is due back on the trail on Tuesday. Melania Trump and former President Bill Clinton exchanged pleasantries at the foot of the stage in the last minute moments before the show began. Trump also invited Mark Geist, a survivor of the 2012 terror attack in Benghazi, Libya – a defining moment in Clinton’s tenure as secretary of state. Former New York Mayor Rudy Giuliani and Lt. Gen. Mike Flynn, two Trump advisers, were seated up front near the stage. Also, after the battle, a CNN/ORC poll of voters who watched the showdown said Clinton topped the Monday night’s debate by 62% of voters while just 27% said they thought Donald Trump did great. Voters said Clinton’s views were more expressively stated than Trump’s and that she understands the challenges of America by a wide gap of more than 2-to 1. The resounding defeat is similar to Mitt Romney’s dominant performance over President Barack Obama in the first 2012 presidential debate. Clinton also was seen as having done a better job addressing concerns voters might have about her potential presidency by a 57% to 35% margin, and as the stronger leader by a 56% to 39% margin. The gap was smaller on which candidate appeared more sincere and authentic, though still broke in Clinton’s favour, with 53% saying she was more sincere vs. 40% who felt Trump did better on that score. Trump topped Clinton 56% to 33% as the debater who spent more time attacking their opponent. This is because the debate highlighted Trump’s tendency to make false claims as he made inaccurate statements on everything from laws regarding policing, his support for the Iraq War and his contention that Clinton was behind the so-called birther conspiracy – some of which he denied saying during the debate. And the survey suggests Clinton performed more than what people expected. While pre-debate interviews showed that Clinton was expected to win but in a small margin – a 26-point margin – that jumped to 35 points in the post-debate survey. In compiling the post, CNN/ORC post-debate poll, 521 registered voters the September 26 debate were allowed to vote. Respondents were originally interviewed as part of a September 23-25 telephone survey of a random sample of Americans and indicated they planned to watch the debate and would be willing to be re-interviewed when it was over.